browse our library, either in person or online and find something that fits your interests and needs. Our main church library is located in the Fireside room adjacent to the lobby. The library is open for use any time South St. Campus is open. This family library includes resources for infants through adults. Our Keslinger Campus library includes resources for young adults and adults. The library is open for use any time Keslinger Campus is open. 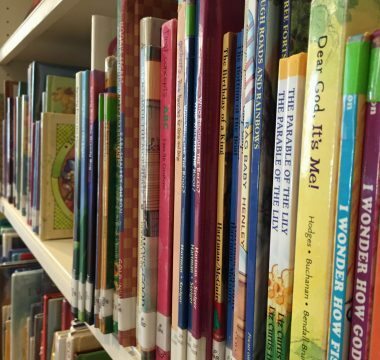 This library houses a large selection of resources for toddlers through sixth graders. Items may be checked out by parents each Sunday between services, from 10:15 AM. – 10:45 AM and after the second service. Our Keslinger Campus Children’s Library is in need of individuals to serve one Sunday morning per month between services and after second service to help families check out resources. Our Keslinger Campus Adult Library is in need of individuals to serve one Sunday morning per month between services and after second service to help individuals locate and check out resources. Contact Nancy Wong at library@chapelstreetchurch.com if you would like to volunteer. A library card is required to check out resources. Card applications are available on both campuses. Materials checked out from the library can be returned to either campus. You can reserve items through the online catalog or at either campus library. Click on online catalog to search our collection 24/7. If you have a library card, you can see a list of the items you have checked out and also your circulation history. Items may be reserved and renewed. You can also keep track of items that you are interested in by adding them to a “book bin” that can be printed out or emailed. Your last name and then first name, typed in lower case as all one word, is your username. Your password is the last four digits of your library card. If you don’t know your library card number or have further questions about the online catalog, please email library@chapelstreetchurch.com. Requests may be made by filling out a request card available at the library or by emailing library@chapelstreetchurch.com. These requests will be considered according to our budget and selection policy. The library accepts new and used donations in good condition without markings. Materials should be published within the last 10 years, unless they are classics. Any materials that we are not able to use will be passed on to other libraries or Christian organizations. Any resources donated to the library should be clearly marked “Library Donations”. Donations can be left at either campus Welcome Center or brought to the South St. Campus receptionist during business hours.